Cannabis Seeds - Grow Your Own 2019! 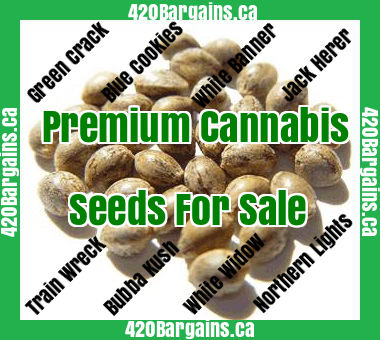 420Gangsta.ca has researched over 50 different online sites that offer to sell cannabis seeds. Out of our research, we have gathered a list of legit companies that ships cannabis seeds (generally) within one business day and private secure ordering. Banana Kush Feminized Strong strain with high THC. Suitable for in and outdoors. Short flowertime. Blueberry Feminized Has a very high CBD. Great for growing outdoors. Suitable for medical use. Blueberry has been a very popular strain of marijuana for many years now. Although it is 20% sativa, it’s still a powerful indica that delivers a distinct high. Blackberry Kush Feminized. There are minimal side effects with this popular strain. Perfect for growing indoors due it compact size. This strain has an euphoric effect. The hybrid is a cross between Blackberry hybrid and Afghani indica. So, its makeup is 80% indica and 20% sativa. To Buy Blackberry Kush Feminized Cannabis Seeds. Bruce Banner, Feminized, Similar to the original Bruce Banner strain, Strong strain with high THC, Gives relaxation, happiness and energy, has amazing effects on those with mood disorders such as depression. California Dream Feminized. This cannabis strain is mixed with 30% sativa and 70% indica. The effects are Body relaxing, Mind relaxing, Euphoria, Happiness, Focus, Heightened Senses, Sociable and long lasting! OG Kush This cannabis strain produces a high yield and is perfect for growing indoors. Delivers a heavy rush of euphoric energy. Grow your own LSD Feminized. This strain has high levels in THC and CBD. Easy to grow. The LSD strain of marijuana delivers a light-minded, heavy-body high. Great relief for Joint pains, Muscle spasms, Back pains, Migraines, PMS and Cramps. Pineapple Haze Feminized Produces high yield. Suitable for medical use. Has powerful buds! Black Widow Feminized and easy to grow. Very high level of THC. Suitable for medical us. This sativa-dominant strain is about 65% sativa and about 35% indica. Black widow is a very potent strain of cannabis with between 15% to 28% THC contents. The medical marijuana effoects are: Stimulate appetite. Relieve anxiety and stress. Cure insomnia and induce peaceful sleep. Relieve chronic pain. Relieve depression and cure nausea. Stimulate mental alertness and creativity. White Rhino Feminized. Strong strain with high THC, Is very soothing and also for beginners. To Buy Blue Cookies Cannabis Seeds. All trademarks and servicemarks are the properties of their respective owners. Â© Copyright 2019 420Gangsta.ca All rights reserved.